As noted before my 4 year old cowboy was sent home from school yesterday. He looked like a ghost and had a fever. He quickly went to sleep. During the day he felt fine (thanks to iboprofen). By the time JL got home he was getting worse again. I took his temperature and it was 102.5 in one ear and 101 in the other. *sigh* We called our doctor and were told to alternate Motrin and Tylenol. My guess (since there are no other symptoms) is that he has another ear infection. This morning he got up with no fever (97.4 in one ear and 99 in the other). He quickly pounced out of bed and made up a "I’m all better" song. With any luck he is all better and we will be able to spend the day with my family and have a nice Chanukah dinner with them this evening. Now to play catch up on some photos. Tuesday night I was doing some cleaning since our friends were coming over Wednesday night. I happened to stumble upon a gift that NHL received several years ago. Aunt L and Uncle J sent him an amazing pair of cowboy rain boots. They were HUGE on him. I decided to look at the size and they were perfect for him now (still a good amount of room to grow). Here is what happened when they were taken out. 1. Daddy helps NHL put the boots on. 2. Every cowboy needs a Monsters Inc hat – right? 3. Cowboy NHL gets his horse. 4. A close up of the boots. After this NHL decided it would be more fun to tote the boots all over the house and we lost one. 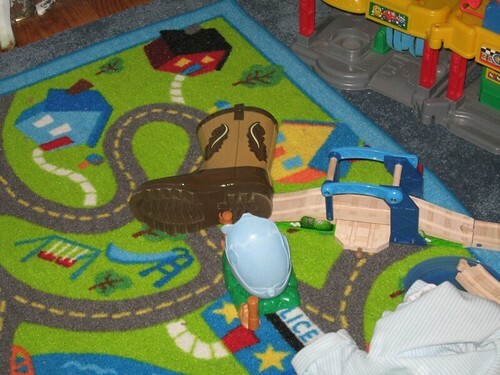 Later we discovered the location of the boot. Now I am off to take a certain little monkey’s temperature while daddy and little brother nap on the couch.